Drivers in New York State are expected to keep a safe distance between themselves and the vehicle in front of them. Failing to do so is a violation of VTL 1129(a) Following Too Closely, commonly known as tailgating. Vehicle and Traffic Law does not establish how far back a driver must be in order to in compliance with the law. While there are some guidelines drivers can use to help reduce the chances of a tailgating ticket, police have a lot of discretion in enforcement. What Are the Penalties for Tailgating in NY? Fine: Drivers convicted of tailgating (following too closely) in New York can be fined up to $150 for a first offense. A second offense in 18 months raises the maximum fine to $300 and a third offense in 18 months can mean a fine of up to $450. Points: Following too closely (tailgating) is a 4-point offense in New York. This makes it one of the higher-point traffic violations in the state. Surcharge: A conviction or guilty plea for following too closely in New York obligates a driver to pay a state surcharge of either $88 or $93, depending on where he/she was ticketed. Driver Responsibility Assessment (DRA) fee: Drivers who receive six or more points on their license will have to pay a DRA. This is an additional fee on top of the fine and surcharge and is paid directly to the NYS DMV. A DRA costs $300 plus $75 for each point over six. A single conviction for tailgating (4 points) combined with any other 2- or 3-point offense (e.g. red light ticket) can result in having to pay a DRA. Auto insurance increase: Following too closely is the No. 2 cause of automotive accidents in New York State, according to DMV crash data. As such, insurance companies are likely to raise rates significantly following a conviction for the offense, even if the ticket was not the result of a collision. One study estimates that insurers will raise rates on average by as much as 30% for tailgating. What Is Considered Tailgating (Following Too Closely) in New York? [T]he driver of a motor vehicle shall not follow another vehicle more closely than is reasonable and prudent, having due regard for the speed of such vehicles and the traffic upon and the condition of the highway. While such a law appears reasonable from a road safety perspective, its vague and subjective standard makes it challenging for drivers to conform to the law’s requirements. In effect, NY VTL 1129 assigns to drivers the task of judging the speed of the flow of traffic and other relevant highway conditions and determining the reasonable distance to be maintained between automobiles. However, what may seem to one driver like a reasonable and a good faith attempt ensure a safe traveling distance between cars may not be shared by a ticketing officer. The upshot of New York’s following too closely law is that police officers carry a great deal of discretion, and it seems they can almost arbitrarily determine that a driver has failed to maintain a safe distance between themselves and another automobile. VTL 1129 leaves a lot of room for interpretation as to what constitutes being “too close” to another vehicle. Unfortunately, for tickets like this, that interpretation is largely left up to the officer. The good news is that there are ways to defend against such tickets. In cases of an accident, the officer rarely witnesses the instance of tailgating. While the officer’s judgment is considered admissible regardless, having an eye witness who can testify on behalf of the following driver can provide for a strong defense. If the witness was present for the accident (e.g. a front-seat passenger), he/she can testify that the following driver’s speed and distance were sufficient for the conditions present and that other factors contributed to the accident. 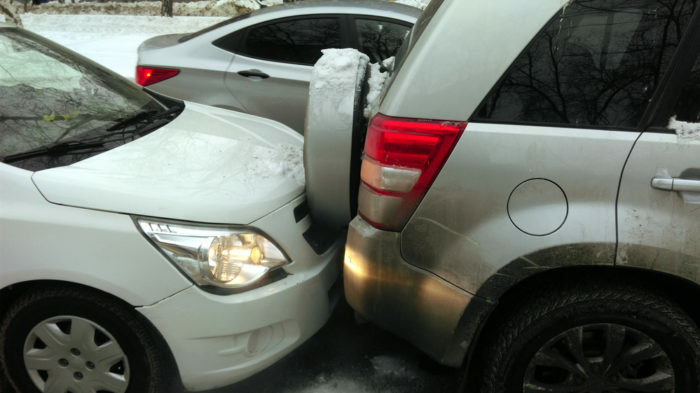 If there is no accident, then the officer is usually an eye witness to the instance of tailgating, which makes defense harder but not impossible. The driver’s best course of action is to put together an argument showing how the conditions made the distance between the cars reasonable and prudent. Each case is different, and any defense will be best executed with the advice of an experienced traffic ticket attorney. In 2017, police throughout NYS issued 26,040 tickets for following too closely (VTL 1129), according to data from the DMV. This is a 4% increase of the number of tailgating tickets written in 2016. Erie County handed out the most tailgating tickets in 2017, with 2,837. Long Island’s Nassau and Suffolk counties wrote the next most tailgating tickets: 2,643 and 1,469 respectively. Tickets for following too closely comprise between 0.6% and 0.7% of all traffic tickets written in NYS on any given year. However, some counties give out a much higher proportion. Saratoga’s 1,131 tailgating tickets in 2017 represented 2.5% of all tickets in the county for that year. By contrast, tailgating tickets represented between 0.1% and 0.3% of all tickets in 2017 in each of New York City’s five boroughs—the lowest proportion of any county in the state. Following too closely resulted in 52,467 automotive collisions in 2017, making it the second-most common factor in crashes statewide (after driver distractions). Fortunately, more than half (28,444) of all crashes involving tailgating are property-damage-only, making it the most common contributing factor in non-fatal, no-injury accidents. In addition, tailgating-related accidents rarely results in death; only 20 accidents involving tailgating also involved fatalities. Why is tailgating considered dangerous? Following a vehicle too closely (tailgating) is dangerous because the driver who is behind may not have enough time to slow down or stop should the speed of traffic change. In fact, it is one of the top factors in automotive accidents in New York State. No, but it is illegal and a violation of New York State Vehicle and Traffic Law section 1129. A conviction for tailgating (following too closely) can result in a $150 fine and 4-points for a first offense. How can you ensure you are not following too closely? While the statute for VTL 1129 is broad and leaves much open to interpretation, a good rule of thumb to follow is to use the three-second rule. This requires choosing a stationary object (tree, road sign, etc.) and counting the number of seconds between when the car ahead passes it and when the car behind passes it. If the amount of time between each car is three seconds or more, then the driver is likely a safe distance away. Of course, if road conditions are less than ideal (wet, icy, foggy, etc. ), a driver may want to leave more distance. Is tailgating considered reckless driving? Tailgating is not necessarily considered reckless driving. However, following too closely could be one of several behaviors that an officer might factor into a decision to charge someone with reckless driving—for example, a combination of drunk driving, unsafe lane changes, and tailgating could be grounds. How can I stop someone from tailgating me? A driver may be following too closely for a variety of reasons. He/she may want to pass, or they could be unaware that they are too close (distracted, upset, etc.). Another reason could be that they simply have not developed the proper driving habits. The safest thing a driver in front can do if they are being followed too closely is, if possible, signal and then when safe change lanes to let the tailgating vehicle pass. Very gradual deceleration may also work if there is enough space to do so safely. We sometimes get people who think that being tailgated is an excuse for or a defense to speeding, but unfortunately it’s not. What Should Drivers Do About Tailgating Tickets in New York? If you or someone you love have been ticketed for Following Too Closely under NY VTL 1129, you are strongly advised to seek the representation of a competent attorney to advocate for your rights. The attorneys of the Rosenblum Law Firm are experienced traffic violations attorney who can provide expert and aggressive representation to help reduce or avoid the points, fines and auto insurance increases associated with a conviction. Email or call 888-883-5529 for a free consultation.